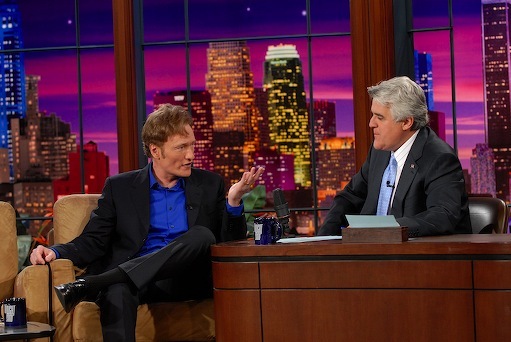 Jay's still keeping the chair warm for Conan, set to take over The Tonight Show in 2009. Friday (May 25) marks 15 years since Johnny. Jay Leno's been taking it on his ample chin throughout a long and profitable tenure as only the fourth permanent host of NBC's storied Tonight Show. Critics, including this one, invariably have compared him unfavorably to David Letterman, whom he's been whipping in the late night Nielsen ratings for more than a decade. But Friday (May 25) marks Leno's 15th anniversary as Johnny Carson's successor, so he deserves a break today. It all began with a May 25, 1992 monologue joke about Dan Quayle's run-in with Murphy Brown. 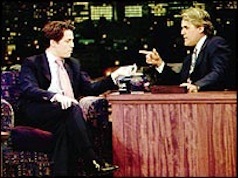 To Leno's later regret, he failed to acknowledge or thank Carson on that debut show, which featured first guest Billy Crystal. But time marches on, and the late Carson isn't in a position to care anymore. 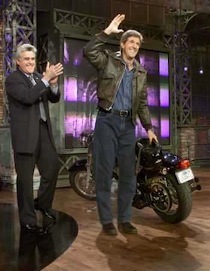 So here's a list of Tonight's top 10 moments with Leno in the saddle. He'll be on the job for at least two more years before bequeathing the show to Conan O'Brien in 2009. Or at least that's the plan. 10. March 13, 2000 -- New York Giants defensive back Jason Sehorn proposes marriage to Law & Order star Angie Harmon while Jay beams his approval. She accepts and they're later married in Dallas. 9. May 16-20, 1994 -- Leno returns the show to its New York roots, originating a week's worth of shows from NBC's famed "30 Rock" studios. A surprise guest is former Tonight host Jack Paar, who lets it be known that he doesn't like upcoming guest Madonna. 8. March 4-10, 2005 -- Prohibited from telling Michael Jackson jokes because he's a witness in his child molestation trial, Leno calls on other comics to stand in for him. They include Dennis Miller, Roseanne Barr and Brad Garrett. 7. 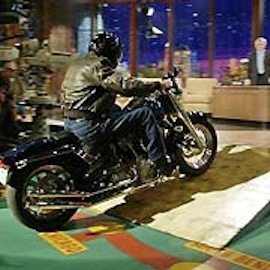 Nov. 12, 2003 -- Striving to loosen up his dour image, Democratic presidential candidate and future nominee John Kerry roars onto the Tonight set as a mystery guest on a motorcycle. It doesn't help all that much, but nice try. 6. May 9, 1994 -- Comedian Bobcat Goldthwait impulsively decides to set fire to the Tonight couch while promoting his new film Shakes the Clown. This doesn't go over too well with Leno or NBC, leading to his ban from the show. But Goldthwait later plays off the incident while playing himself on HBO's The Larry Sanders Show. 5. March 2, 1994 -- The "Dancing Itos" debut during the ongoing O.J Simpson trial. The mockups of Judge Lance Ito become a pop culture touchstone, appearing 10 more times on Tonight, sometimes in tandem with an actress playing prosecutor Marcia Clark. 4. May 20, 1993 -- Tonight originates live from Boston's Bull & Finch Pub, where the cast of Cheers is celebrating that night's series finale on NBC. Several of the stars are notably plastered if not blind drunk. Leno barely survives it all. 3. May 12, 2003 -- As part of a ratings sweeps stunt, Today co-host Katie Couric and Leno trade jobs for a day. It marks the only time he's stepped aside for a substitute host. Couric, playfully showing off her legs and taking a crack at a monologue, interviews guest Mike Myers among others. 2. 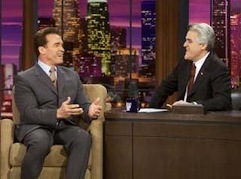 Aug. 6, 2003 -- Arnold Schwarzenegger chooses Leno'sTonight as the forum to announce his candidacy for the California governorship. A throng of media cover the event in an adjacent holding pen before Schwarzenegger walks to nearby Johnny Carson Park on NBC's Burbank lot to hold a press conference. 1. July 10, 1995 -- Actor Hugh Grant makes his first public appearance on Tonight after his much-publicized arrest on Sunset Boulevard in the company of prostitute Divine Brown. For openers, Leno famously asks, "What the hell were you thinking?" The show draws a huge audience and marks the beginning of Leno's longtime dominance over Letterman's Late Show. Until then, Letterman had been riding high in the ratings while NBC brass worried whether they'd made the right choice in bypassing him in favor of Leno.